When you’re involved with a building project and are looking for exterior columns, Melton Classics is the only place to go. Melton’s offers the industry’s largest and most comprehensive selection of exterior columns in the country. Whether your project is of a large or small scope, commercial or residential; Melton Classics has the perfect exterior columns collection that will have the right fit for your project. If your project calls for exterior columns with an authentic architectural entasis taper, simple straight tapered columns, or some non-tapered round exterior columns, we have what you’re looking for. Custom exterior columns are what we’re all about and our on hand design specialist can help you transform your drawing to the actual exterior columns you’ve been dreaming about. If you have an existing drawing of the exterior columns for your project, fax it to us for a quote. You won’t find better value anywhere else when it comes to exterior columns. We offer a huge selection of exterior columns, wood columns, GFRC columns, precast columns, interior columns, column covers and column wraps. 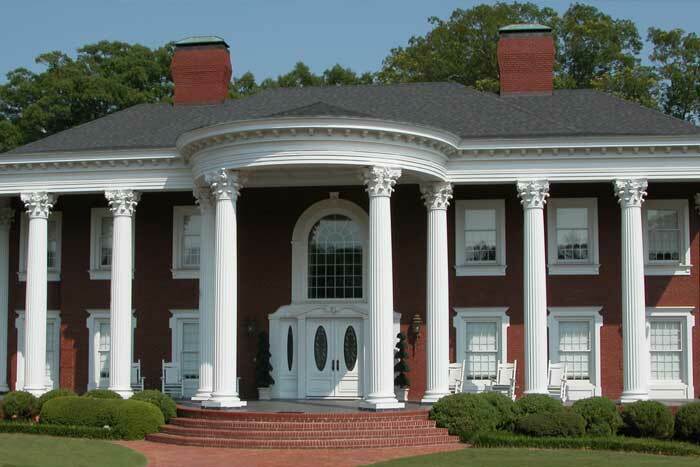 Melton Classics also offers round columns and engaged pilasters to compliment our round column fiberglass designs. Feel free to call one of our experienced exterior columns specialists at 800-963-3060 for a free consultation. Let us give you a quotation on the exterior columns you need so you can see for yourself how well we can accommodate your budget. Melton Classics’ selections of materials, designs and available finishes are the most comprehensive selection that you’ll find in the industry. With such a vast selection we know it’s even more vital to have experienced exterior columns specialist to make sure you’re aware of all the exterior columns that are available to you. With all the available materials we use, finding ones that will fit your individual application is no problem. If you need guidance on choosing the right product for your job, let explain to you why it might be more advantageous for you to one design or material over another. The extensive selection of exterior columns that are offered by Melton Classics are the industry standard for design and quality. Our exterior columns are crafted in your choice of over twelve quality column materials including fiberglass, wood, GFRC and fiberglass and stone composites. Our exterior columns are also available in an essentially limitless selection of column designs. When it comes to purchasing the exterior columns for your project, it’s clear that the only choice is Melton Classics. With an endless selection and knowledgeable specialists on staff to help, you’ll get the exact exterior columns that will best suit your job. Visit us today at www.meltonclassics.com and see why we’re the industry leaders.